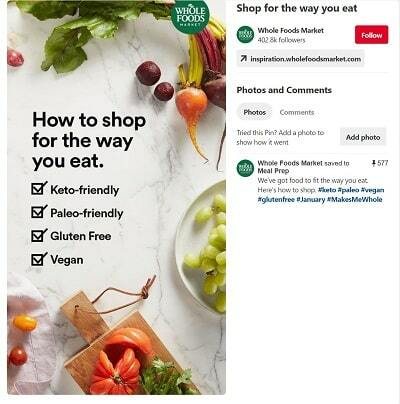 Pinterest is somewhat of a dark horse: While it’s a big name in social, many brands don’t quite know how to handle the platform. Instead, they focus efforts on Facebook and Twitter, with some Instagram thrown in for visuals. That’s a mistake. A big mistake. Pinterest is a social bookmarking site, not a broadcast service. So, be social, not commercial! According to eMarketer, the only platform more influential than Pinterest is… Facebook. That’s right – not Twitter, not Instagram; Pinterest influences more buying decisions than both. What’s more, a mind-blowing 93% of Pinners report they use the platform to make purchasing decisions, 87% have purchased something because of Pinterest, about two-thirds look at their Pins while out shopping, and approximately half of Pinners have made a purchasing decision after viewing a Promoted Pin. Put all this together, consider the fact that Pinterest makes for easier success than the Big Names, and throw in 200 million monthly active users and 2+ billion monthly searches, and we think there’s irrefutable evidence that your brand should be on Pinterest. If you don’t have a Pinterest business account already, switch over! Pinterest has made it easy to convert your existing personal account, so you can brand your Pinterest presence, keep it professional, and keep your personal and business Pinterest accounts very, very separate. All is right with the world. As with any social network, your profile photo is brand gold. So, make it count! Your profile photo will display at about 165 x 165 square. Navigate to your Pinterest account settings and take some time to fill out all your profile information: your business name, username (hopefully, you chose well! ), location, website and, perhaps most importantly, your “about you” section – an important chance to let your business shine, optimize your Pinterest keywords, and showcase your personality. We know – it’s kind of a pain. But, confirming your website (Settings > Profile > Confirm website) has a host of benefits, including boosting your pin rankings, adding your logo to each Pin (“Save from yourbrand.com”), and even seeing what others Pin from your website. Do. Not. Skip. This. Step. Once you’re up and running, install Pinterest Analytics immediately. This is key to understanding what you’re doing right and where you could improve, as far as your Pinning strategy goes. And speaking of strategy, the cornerstone of a good Pinterest strategy is strong Boards – boards that speak to your audiences’ interests, and that are worded (make that, key-worded) appropriately – and quality Pins that use keywords to capture traffic. Don’t just jump in blind; plan your Boards carefully, being sure to name them to capture search traffic (while not competing with thousands of similar boards). In the dance of ever-changing social media image dimensions, Pinterest is relatively forgiving. Currently, the platform scales its thumbnail images to 236 pixels wide; upon expansion, images open to 564 pixels wide. Bottom line: For now, upload image at a minimum 600 pixel-width, with an aspect ratio in the 2:3 to 1:3.5 range. Many social posts today are ephemeral – here today, gone tomorrow. (Think Snapchat and Instagram Stories.) Pinterest, on the other hand, is all about evergreen content: Posts, articles, videos, guides, and other content that will be as relevant tomorrow as it is today. Pinterest is perfect for this kind of content, given that your pins have the longest half-life of all social sites – 151,200 minutes (about 3.5 months) vs. just 24 minutes for Twitter and 90 minutes on Facebook. Your Pins have staying power. One of the easiest ways to invite your readers to Pin your content, is to allow for easy Pinning from your site. Enter the Pinterest Pin Share button, which offers one-click Pinning without navigating away from your site, and without any need for a pre-installed Pinterest Pin browser button (which many people do not have). And, of course, a Pinterest follow button makes it easy for your blog readers and website visitors to find and follow you on the platform with a simple click. We know, we know – we’re always saying this! 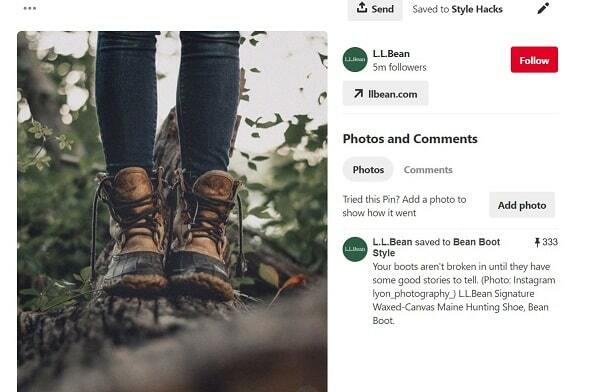 But, truly, consistency is key to any successful social strategy, including on Pinterest. The standard rule of thumb is to Pin at least once per day, preferably during your peak times – typically, evenings and weekends for U.S.-based brands – and sprinkled throughout the day, if you’re posting more than one Pin daily. Pinterest is a very (VERY) visually-oriented social platform, so if you want to wow the Pinterest audience, then you need to use your most eye-catching images. What’s more, consider investing ~15 extra minutes per post to create a custom image, for example with text overlay (“15 Reasons You’d Hate a Long Weekend in Paris”) – a winning formula on Pinterest, by the way. The mistake many make on Pinterest is assuming that only images matter. Not true! Your Pin descriptions are very important, not only offering viewers a clue as to the content that awaits but also granting the opportunity to add keywords to your Pin. Pinterest Rich Pins add extra information and context to your Pins, by pulling metadata from your site (where your content lives). They’re available only for certain types of content, but it’s some of the most common content, such as products, apps, and recipes. As always, social is a key element to any social platform. Pinterest is no different. This is not a broadcasting site. Engagement and interaction are key, whether it’s your employees liking and engaging with other Pins, or your biggest fans contributing to a Group Board. Now go forth and pin! You’re ready.